The new English version of Sponsorship Breakdown is now available in Arabic, Farsi, Punjabi, Spanish, simplified and traditional Chinese, and (online only) French. Sponsorship Breakdown was revised in the fall of 2017 to reflect changes to immigration law — most importantly, the elimination of conditional permanent resident status. This booklet is for permanent residents who need help when their sponsor stops supporting them. 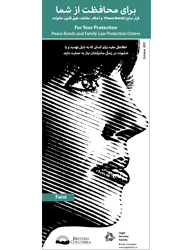 Back in stock with a whole new look: we’ve redesigned and updated the translations of our popular publication, For Your Protection: Peace Bonds and Family Law Protection Orders, to match the current English version. For the first time, we now have a Farsi edition as well as the revised Punjabi and Chinese (simplified and traditional) booklets. The updated French version (online only) will be available shortly. The others are available now in print and online. For Your Protection explains in plain language how and when people can apply for peace bonds and family law protection orders, and the differences between the two. The booklet is published in collaboration with the Ministry of Public Safety and Solicitor General. This publication is available for order on the Crown Publications website. The Consumer and Debt Law is a problem-solving manual for advocates and other legal professionals who help clients with consumer or debt problems. Over 45 topics are covered, including problems people experience with consumer purchases, contracts, borrowing money, and being in debt. Each section includes sample client problems, summary of the relevant law, recap of information needed from clients, and suggestions for solving the client’s problems. It is available as a Clicklaw Wikibook and in a limited print run. · a print-on-demand copy is available to order. This manual replaces Consumer Law and Credit/Debt Law, which was published by the Legal Services Society. We’ve recently updated the Dari, Kurdish, and Pashto versions, and reprinted Spanish. The card is also available in Arabic, Farsi, and French. These info cards include the legal aid immigration phone line and other legal aid services for refugee claimants. All languages are available to order on the Crown Publications website. MyLawBC’s Dialogue Tool has been updated. The Dialogue Tool helps you create a separation agreement that addresses your family’s needs. You start with an intake process where both you and your ex answer questions about your situation and set out your ideas for the future. Once you’ve both finished this step the system looks at your answers and creates a custom template separation agreement for you to fill out and complete. The questions asked during the intake process have been rearranged to follow an order that users thought was more natural. The legal clauses that are given to users have been updated to make them easier to understand. A new section was added to show the original text of the legal clauses in the template so you can refer back to it after you have edited them. We’ve heard a lot of positive things about the Dialogue Tool and we hope with these changes we’ll hear even more. You can try out the improved Dialogue Tool or learn more about it on MyLawBC.com. This booklet replaces the Live Safe – End Abuse fact sheet series.